In a large pot, heat the oil over medium heat. Add the onions and garlic and saute; until the onions are translucent, about 5 minutes. Add the salt, pepper and sugar and stir. Add the wine to deglaze. Add the tomatoes and bay leaves, then simmer uncovered over low heat for 20 to 30 minutes. Remove and discard the bay leaves. Season the sauce to taste, adding the crushed chilies if you wish to have some heat. Line a large shallow baking pan with foil and oil lightly. Combine all ingredients and shape into meatballs, about 1 1/2 to 2 inches in diameter. Broil the meatballs about 8 inches from the heat source for about 10 minutes. Turn and broil for 10 minutes longer so that the exterior gets seared evenly. 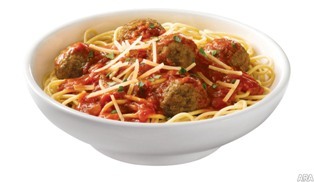 Put the meatballs in a large saucepan and cover with marinara sauce. Cover and simmer for 20 to 30 minutes and serve over cooked spaghetti or with your favorite pasta. Garnish with fresh shaved parmesan cheese and fresh sliced basil.